Amazon India is hosting Fab Phones Fest for mobiles and accessories from March 25 till March 28. The e-commerce giant is offering upto 40% discount on smartphones across various budget categories and accessories. The sale has a couple of popular phones like the OnePlus 6T and Mi A2 up for grabs in addition to some good exchange offers on phones like LG V40 and Nokia 8.1. During the Amazon Fab Phones Fest, SBI credit card holders are entitled to 5% cashback on products purchased on EMI. 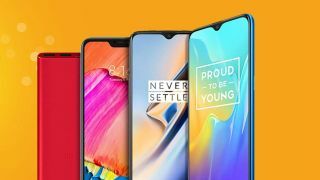 We have listed below some of the best smartphone deals that are currently live on Amazon India. Xiaomi's stock Android phone, the Mi A2 which was launched last year is up for grabs at Rs 11,999 for the 4GB RAM variant. The Mi A2 features a bright display and is powered by the Snapdragon 660 chipset with 4GB of RAM and 64GB of storage. The dual camera setup on the back is decent and it provides a good battery life. During the Amazon India Fab Phones Fest, Realme U1 will be available at Rs 9,999 which is its lowest retail price till date. The Realme U1 is a mid-range smartphone featuring a Full HD+ display, dual rear cameras and a front-facing 25MP selfie camera. It is powered by MediaTek Helio P70 chipset and runs on Android 8.1 Oreo-based Color OS 5.2. This setup is managed by a 3,500mAh battery. With a starting price of Rs 8,999, the Redmi 6 Pro has become a great option for people looking to buy an entry-level smartphone in India. The phone has a Full HD+ display, dual rear cameras and is powered by Qualcomm Snapdragon 625 chipset. This is backed by 3GB of RAM and 32GB onboard storage. There is a 4,000mAh battery which will easily last for 2 days on moderate usage. In addition to these deals, there are exchange offers on a couple of premium smartphones. The LG V40 is available to purchase for Rs 49,990 and an extra Rs 10,000 off on exchange of old smartphones. Similarly, buyers will get an extra Rs 2,000 off on purchase of Nokia 8.1 which is priced at Rs 29,999. Samsung Galaxy S9 is also up on sale for Rs 48,900 with an additional Rs 9,000 off on exchange. Huawei Mate 20 Pro is available for Rs 64,990 with a wireless charger bundled.